As a preclinical CRO, Pipeline Biotech can perform laboratory animal and cell-based bioassays on batch releases of pharmaceutical formulations for clinical studies or patient medication, to meet the demands of Quality Control units in the pharmaceutical industry. Current batch release tasks include potency testing of hormones, vaccines, antibodies and other biologics, either according to EP/BP/USP pharmacopoeias or to product-specific methods. With an expertise in complement-dependent cytotoxicity (CDC) assays, Pipeline Biotech is able to provide a customized complement-dependent CDC assay service with high focus on specific customer requirements. CDC is part of the antibody-based immune system and refers to the lysis of a target cell in the presence of complement system proteins. The CDC activity is widely used for potency determination of pharmaceutical compounds. Pipeline Biotech provides CDC assays with eight concentrations using geometric progression in either duplicates or triplicates depending on the client’s needs. 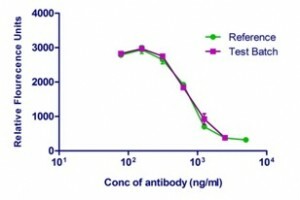 Dose-response curves are generated from the data using a 5-parameter logistic function to report the relative potency measured against a Reference Standard. Pipeline Biotech is highly experienced in technology transfer of bioassays from development laboratories, where careful attention must be given to specific details in order to enhance ruggedness. This leads to greater percentage of assays meeting acceptance criteria and reduced downtime. Significant parameters include assay documentation, transfer of knowledge on assay performance, effects of defined small changes to the assay procedure and specifics of new analyst training. With all the pressures confronting the biopharmaceutical industry today, ultra-efficient and transparent bioassay methods and transfer processes are required to ensure a faster track to regulatory submission. At Pipeline Biotech we work closely together with our clients in order to assure this efficiency and transparency by setting realistic timelines, creating thorough documentation and supporting all activities with a highly qualified and experienced team. These are key factors in streamlining the assays of biologics. Pipeline Biotech has 15 years of experience in performing experimental animal research. Since 2003, the laboratory has been cGLP compliant to OECD Principles on Good Laboratory Practice (ENV/MC/CHEM (98) 17) and currently also meets the cGMP principles of Good Manufacturing Practice (US: 21 CFR 210 and 211. Europe: “The Rules Governing Medicinal Products, Volume IV). Animals are housed at different levels of barrier protection including GMO Class I, GMO Class II and Biohazard Class III. Click on Pipeline Biotech Bioassays for other information.